11 Great Horror Stories (1969) contains famous works from Lovecraft, Poe, and Stoker in addition to stories from a number of lesser-known authors, including Jack Finney, L. P. Hartley, Gerald Kersh, John Collier, A. E. Sendling, Anthony Vercoe, E. Everett Evans, and Fielden Hughes. This collection is ambitiously but inaccurately named. While it may come as little surprise that not all the stories are great (most, in fact, are not), a goodly number of them aren’t even horror. There’s some straight fantasy here, and some historical fiction, and about the only thing these entries share with actual horror stories is some small measure of suspense. On the whole, the quality of the stories here is average. 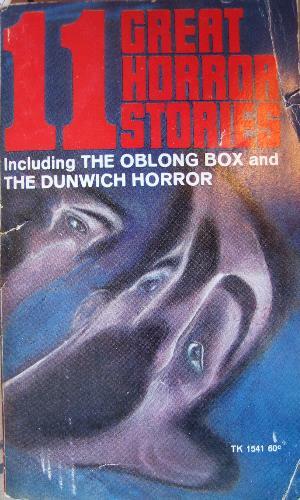 “The Oblong Box” is hardly Poe’s finest work, and all the horror stories are more or less by the numbers. The non-horror tales here, some of which are more ill-fitting than others, are of similar quality to these. The highlights of 11 Stories are Lovecraft’s “The Dunwich Horror” and Stoker’s “The Judge’s House” – you can easily find both of these classics in other, superior volumes, and there’s really not much else to get excited about.